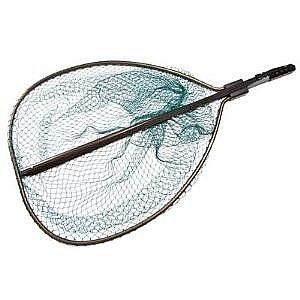 Ideal net for wading where a longer handle could not get in the way. Head measures 19" by 16.5",depth 22".Overall length when open is 37". Fixed frame with hinged opening mechanism. Telescopic handle with rubber grip.Weighing scales to 14lbs.Easily operated with one hand.Handle extends from 24" to 46".Attach with belt clip. 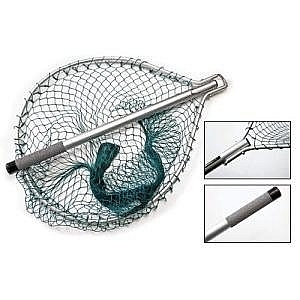 Net opening 19.5" by 17.5",Net depth 27".Overall length 54".Knotless mesh. Weighing scales are concealed in a compartment inside the net handle.On landing the fish,just pull out the scales and weigh the fish in the net.Trout scales measure up to 14lbs. 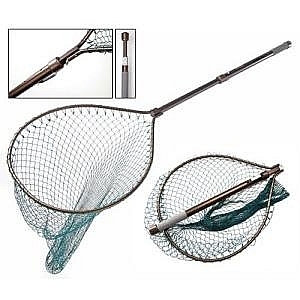 Pear shaped extra sturdy fixed frame net with bronze anodised finish.Rubber grip handle and in-built weighing scales to 50lb.Telescopic handle extends 12" to 44".Overall length extends from 45" to 77".Maximum net opening 33".Carried with built-in adjustable sling.Knotless mesh.Suitable for large salmon or pike.